The next milestone for the mission will be 15 November, by which time the Executive Council must approve a detailed plan of destruction submitted by Syria to eliminate its chemical weapons stockpile. The UN News Centre spoke with the head of the mission, Sigrid Kaag, on Thursday about the latest developments, ahead of her visit to New York for talks next week at UN Headquarters. UN News Centre: Can you describe what you saw during your visit to Syria? Sigrid Kaag: I had the opportunity to visit Syria I believe around 10 days ago now. It was the first call on the Government to discuss the ongoing collaboration in pursuit of the mandate of the joint mission. I also had extensive discussions with the joint mission team – the team that I lead – on where we are with internal preparations, with logistics, with security, given the conditions in the country, and obviously, how we can best support the roll-out of the chemical weapons destruction plan, once approved by the Executive Council of the OPCW. I visited one site, where I was able to see first hand how the facilities, once rendered inoperable… how the complete destruction will take place and then how the inspectors continue with their monitoring and verification. UN News Centre: It has been announced that the mission has completed inspection of the sites declared by Syria. Are there any plans to go into the rebel-held areas? Sigrid Kaag: Of all the declared sites, obviously the joint mission has carried out its first inspection, and has verified the rendering as inoperable of the production facilities… For now, all security aspects are very much closely coordinated with the Government of Syria, which is responsible for the safety and security of the joint mission, as will be the case for other missions as well. And we look at issues of access, safety and security on a case-by-case basis in close coordination with the designated official of the UN family, but also with development partners and counterparts. UN News Centre: During your visit, did you have any contact with people who were affected by the use of chemical weapons? Sigrid Kaag: No, we did not. UN News Centre: What’s next for the joint mission? Sigrid Kaag: We’re waiting of course for the big discussion and decision by the Executive Council on the 15th of November. In the meantime, we are preparing internally as a joint mission, making sure that we are fit for purpose, that we have a good understanding of the requirements in order to ensure effective implementation of the plan. And of course we are very committed to help the Government as a State Party meet its obligations under the [Chemical Weapons] Convention, and therefore, ensure the completion of the chemical weapons programme by the ultimate stated deadline of the middle of 2014. UN News Centre: Who is guarding the actual chemical weapons? Sigrid Kaag: This all falls on the State Party, it’s under its responsibility to ensure the safety as well as access to the sites as well as the weapons. But the production facilities – and that’s why it’s an important day today – the production facilities have been rendered inoperable. Particular discussions are ongoing as to the complete elimination of the chemical weapons themselves. UN News Centre: What will happen to the weapons now? Sigrid Kaag: That is all part of the ongoing discussions within the framework that was agreed between Russia and the US, and supporting the Syrian authorities to look at what is an optimal chemical weapons destruction plan. So it’s too early to comment, that’s for the Executive Council of the OPCW to discuss and to decide upon. Then [it’ll be] very clear what the role of the joint mission will be. UN News Centre: Would such weapons normally be destroyed in the country or somewhere else? Sigrid Kaag: I think ‘normal’ doesn’t apply under the current conditions. There are different scenarios being discussed. My understanding is, from the perspective of OPCW, that under normal circumstances – which is always peacetime – chemical weapons are destroyed in country. However, as we know, the conditions in Syria are such that different options would be explored. 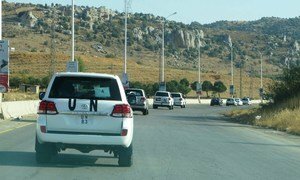 UN News Centre: Having worked in the region for a number of years, this was not your first visit to Syria. What were your impressions this time around? Sigrid Kaag: Well, it’s hard to speak of an impression… On this visit, I have been in Damascus primarily, meeting counterparts, and I have been on site visits. So it’s very hard to speak of my impressions as being holistic. I can’t compare them to the types of visits I would undertake in past personal or professional visits. I think on the overall conditions, the Secretary-General has spoken consistently… the Emergency Relief Coordinator… my visit itself was primarily confined to Damascus, to ongoing dialogue with senior Syrian officials.